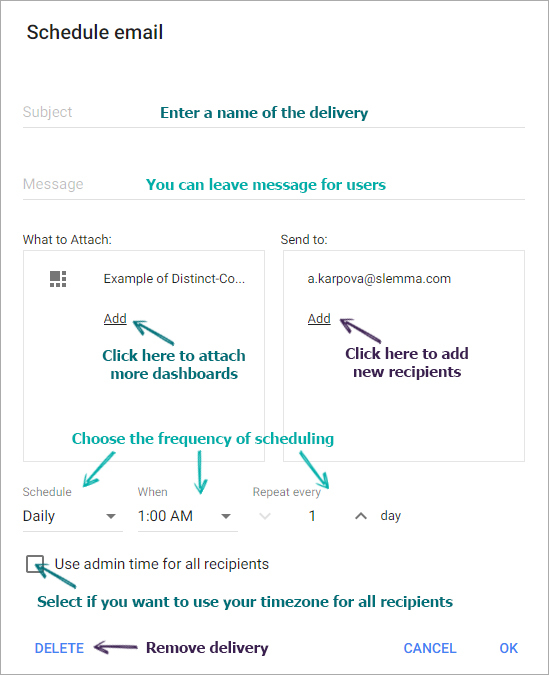 Slemma enables you to create an automatic delivery of dashboards, saved charts and/or presentations to your teammates by email. To use this feature, navigate to the Delivery page from the navigation pane and click on the big blue plus button at the bottom right corner. You will be redirected to the Choose infographics page where you can select the infographics you want to send. After that, the Schedule email dialog window appears. Use the image below as a guide to what each field means. Please note that the list of available recipients depends on their permissions to the chosen dashboard(s), saved chart(s) and presentation(s). E.g. if you choose the dashboard shared with a couple of users, only these users in the list of recipients will be available. Сreator of the delivery is set as recipient by default and can’t be removed. Only creator of the delivery can edit it. All other users have permission to remove themselves from the delivery by clicking the DELETE button. If creator of the delivery will click DELETE, it will remove delivery at all. One user can’t create one delivery for more than 10 recipients. One user can’t create deliveries for more than 20 emails at all.